If we sell our property to our son in stages how do we calculate the capital gains tax? My wife and I are retired, and I need to reduce our exposure to inheritance tax. I was hoping to sell a £240,000 buy-to-let property to my son in stages of approximately 20% a year. My wife and I jointly own the property outright, and because we're retired our earnings are minimal. 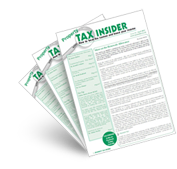 How do we calculate the capital gains tax due at each stage of the transfer? In year 1, calculate the difference between £240,000 and what you paid for the property, say £100,000. 10% of this difference (£140,000) will be your capital gain, and 10% will be your wife's, i.e. £14,000 each. In year 2, you will own 80% of the house, and the house will now be worth, let's say, £260,000, so 80% of this is £208,000. Work out the difference between £208,000 and 80% of what you paid for the property, i.e. £80,000. This difference is £128,000. Since you are now giving away 20% of the property, this equates to 25% of your current ownership, 80% of the property. 25% of £128,000 is £32,000, so you have a gain of £16,000, and so does your wife. In the third year your ownership of the property is 60% etc.